I’m going to start a podcast and have a question. I notice that some podcasts have chapters and others don’t. I’d like to add chapters to mine so that people listening can quickly move between chapters. How do I create chapters? First, good on you for wanting to add chapters. We’ve offered the Macworld Podcast for years as an enhanced podcast (the name for podcasts that include chapter marks and artwork) because we want to give listeners the freedom to bounce between segments. Asking your audience to scrub through a single long audio file when a podcast offers discrete segments is, in my view, unnecessarily burdensome. Launch GarageBand and from the project chooser select Podcast and click Choose. In the dialog box that appears, name and save the project. You’ll notice that the first track in the project is labeled Podcast Track. If the Track Editor pane isn’t showing, click on its button at the bottom-left corner of the window (see the accompanying image below). Add your audio tracks to the tracks area below. You’re now ready to add chapter marks and you can do this in a couple of different ways. The first is to drag into the podcast track an image to accompany your first segment—this can be the podcast’s album art. 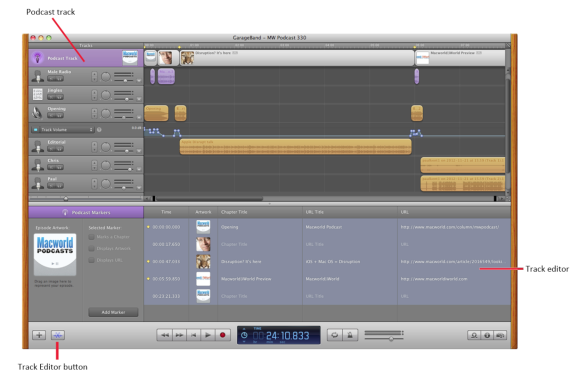 That image will take up the length of the podcast track and your first chapter will appear in the Track Editor. At the point where you’d like to create your next chapter, drag in another piece of art. Another chapter will be created. Or you can dispense with the artwork. Just drag the playhead to where you’d like to add a chapter mark and click the Add Marker button in the Track Editor. A new chapter will appear to the right. Now, enter an appropriate name for each chapter in their respective Chapter Title fields. If you don’t do this, the chapters won’t be created. You can additionally add to each chapter a URL title and URL in the appropriate fields. In our case, we use these to link to related stories on macworld.com. When you’ve finished assembling the podcast and have added all the chapters you care to, drag your episode artwork to the the Podcast Markers section of the window. Now choose Share > Send Podcast to iTunes. A sheet will appear where you configure your export settings. In order for your chapters to appear, you must save the podcast using the AAC Encoder. 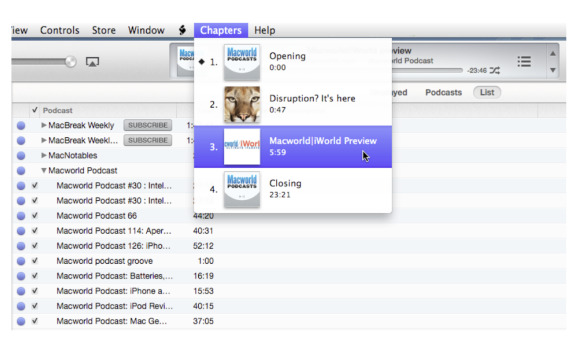 MP3 podcasts don’t support chapter markers or artwork.